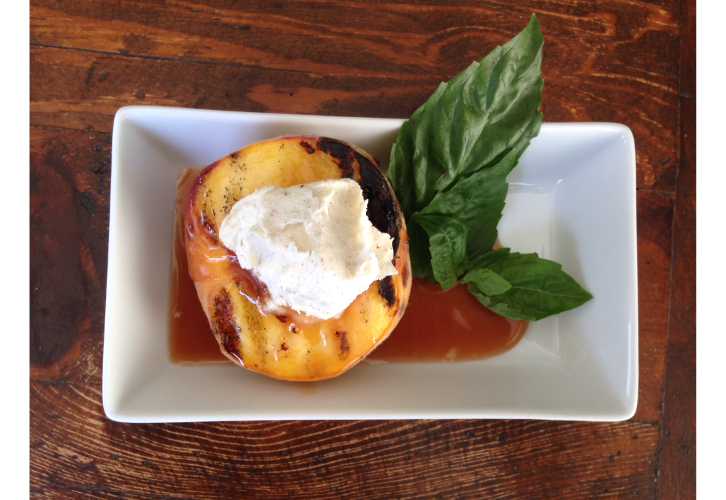 Choosing local also means eating what’s in season….and peaches are it right now! If you are entertaining this Labor Day Weekend, this is the perfect dessert….simple, fresh, easy and sooooo good and you can use your barbecue! I came across this recipe from In Sock Monkey Slippers on Pinterest and it’s a good one! You can prep a bit in advance, but there’s really not much to it! If you are planning for the weekend, you should buy your peaches now so that they have time to ripen. I remember growing up, my mom would ripen peaches on paper grocery bags on the counter for several days…you can use parchment paper or paper towel and just spread the peaches out on them. You can also make the salted bourbon caramel sauce a day or two in advance. Just microwave it before serving. Heat your barbecue to medium high heat. 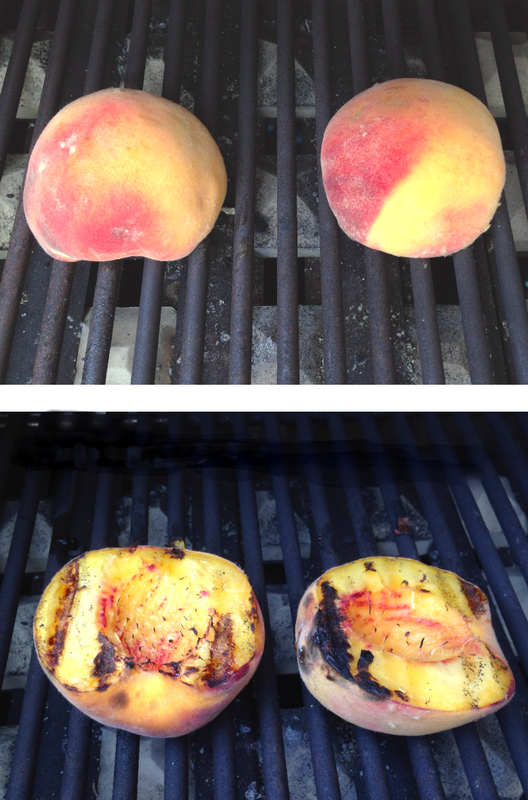 The peaches are ready once grill marks develop…it only takes a few minutes. Don’t be shy with the salted bourbon caramel sauce! Preheat barbecue to medium high heat. Pour sugar and water into a pot. Bring to a rapid simmer over medium heat and swirl (don't stir with a spoon) the mixture until the sugar is dissolved. Without stirring, let simmer until the color changes to a light brown, about 5 minutes, then turn off heat. Slowly stir in heavy cream until combined. Add bourbon and sea salt and stir until smooth. Set aside. Split the vanilla bean down the centre with the the tip of a sharp knife. Split apart. Using the blade of the knife, scrape the beans out of the pod. In a bowl, stir to combine mascarpone and vanilla beans. Set aside. Slice the peaches in half and discard the seeds. 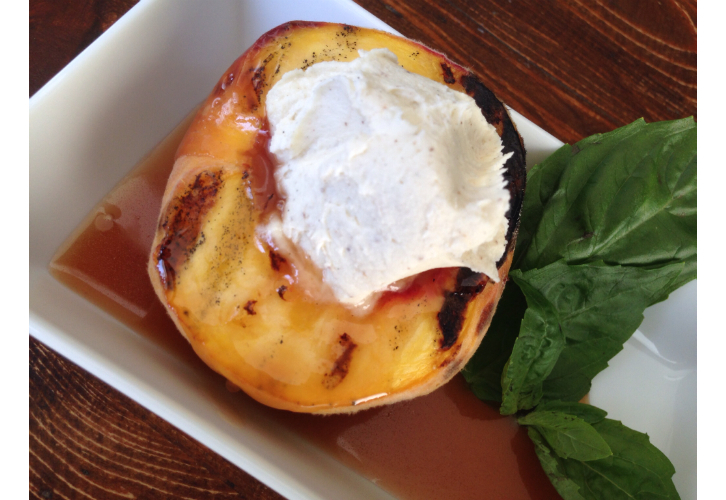 Place cut side down on the grill for 3 to 5 minutes until the peaches are warmed and grill marks have developed. 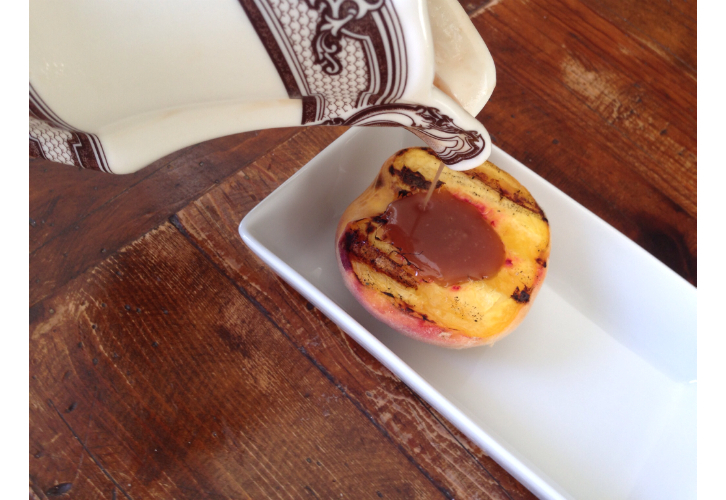 Place one or two halves of peaches on serving plates and spoon caramel sauce over them. Sprinkle with a pinch of fleur de sel (optional). 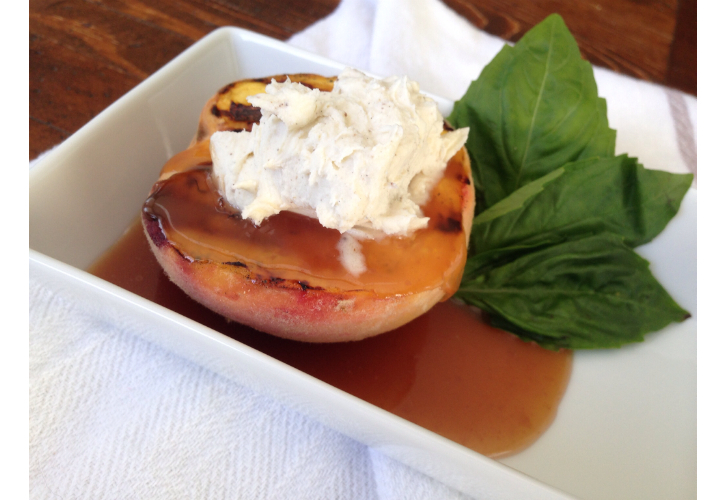 Fill the peaches with a large spoonful of the vanilla mascarpone. Garnish with basil or mint. Enjoy!! If you don’t want to heat your barbecue just for dessert, you can put the peaches on a cookie sheet and heat under the broiler for about 5 minutes. I had a challenge finding vanilla beans, so i used organic vanilla powder that I picked up at The Local Harvest. It worked really well. I LOVED the mascarpone…it reminds me of clotted cream….so rich! But if you prefer, you can use good quality vanilla bean ice cream or whipped cream. So, go grab some peaches from your local farm market and grill ’em up!! !